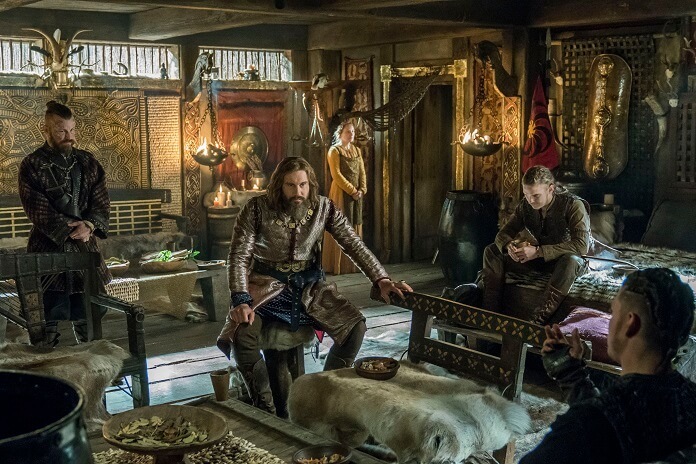 History’s Vikings will finally return after an agonizingly lengthy wait for the second half of season five on Wednesday, November 28, 2018. Part two of season five will see Ivar the Boneless (Alex Høgh Andersen) continuing his tyrannical reign. It will also find Clive Standen‘s Rollo, now a respected Duke, re-entering the Vikings story. 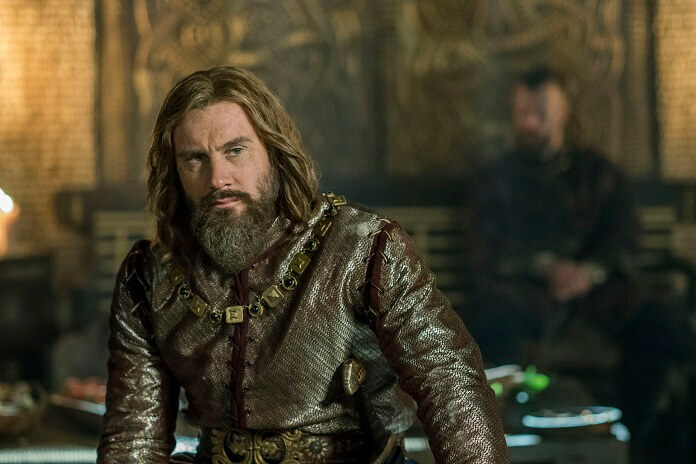 In support of the upcoming Vikings season five part two’s premiere, we spoke with Clive Standen to find out what’s in store for Rollo as he returns to Kattegat. In our one-on-one interview, Standen described Rollo’s journey and how the character’s evolved and matured into the Duke of Normandy. After slipping into the character for five seasons, has your approach to getting into Rollo changed much? But this time, to get back on point, this time coming back it wasn’t so hard. I thought it might be. There was a lot going on with Clive that was parallel with Rollo. You know, I’d been away from the set for quite a long time, for a season. And Rollo had been away from Kattegat being the Duke of Normandy. So, my very first scene was this big scene full of pomp and grace with all my men – a lot of supporting artists as Francia soldiers – and I walk into the Great Hall and I meet Ivar (Alex Høgh Andersen and King Harald (Peter Franzen) and Hvitserk (Marco Ilso). And it was very much actors trying to suss each other out, trying to kind of get a grasp of how the day’s going to unfold – just as Rollo is. Rollo is walking into that room and it’s all a game of cards. He’s holding his close to his chest and he’s going, ‘Who are you? What’s been going on? What are the politics of the situation? Who’s going to try and stab me in the back?’ All that kind of stuff. He’s very much kind of mirroring what I’m feeling. How in-depth did you go in terms of filling in the blanks of what’s happened during the periods when we don’t witness Rollo’s journey? How much did you discuss those periods with Michael Hirst? That was all the information I needed anyway because there’s so much written about Rollo in Normandy, the things he did as the Duke of Normandy and how he accomplished getting the people on his side as opposed to the King of France. He became far more popular than the King of France himself and built Rouen and Normandy into such a powerful state. All of that’s in history books so I know what he’s been doing, and I know how he’s grown as a man and as a leader, a responsible leader of people. I mean, he really has embraced their culture and their religion and his wife. So, that’s all there. It’s just not going to play out on screen. It’s the real peccadilloes that an actor wants, that kind of meat and gravy that you can go and just give yourself such a big backstory. Status is the most important thing. That status is completely different now. Before it was a Rollo grasping at straws, banging on doors hoping someone would listen to him. Now this is a man who has people come to him. He doesn’t need to use force. But there is also that the age has caught up with him. I’m not sure if I’m going to sound really silly saying this because it might actually be in the episode because I haven’t seen the episode in its entirety. I’ve only seen the episode when I had to do my additional dialogue in the ADR studio. But I was under the impression that because we have to cut so many scenes to get it down to 47 minutes, there was a scene we filmed with Rollo talking to King Harald, Ivar, and Hvitserk and Rollo is telling a story about an old Berserker who couldn’t fight in battle anymore. That was all he was good at in life and all he wanted to be known for. In his old age, he gathered all the pots and pans and weapons and anything metal that could find in his house, or his domain, and then climbed to the top of a cliff and threw them all off so they’d clatter and smash and bang against the rocks below just to remind him of the sounds of battle one last time. I don’t think it makes it into the episode – maybe it’ll be on the DVD extras – but it was such a lovely speech to get into the mind of Rollo because he’s obviously really speaking about himself. And this is why he’s come back. He’s a man that’s older now and he’s a ruler. It’s one of those things of is the grass greener on the other side? He’s spent his whole life trying to accomplish some things, trying to be known, be famous, and to be rewarded by the gods and to be respected by his peers. And he’s now, conceivably, he’s got the people, he’s got the wealth, he’s got the land, he’s got the acknowledgement and the riches and all the things that come with that, but is he really happy? Was he happier before? He’s endured so much and accomplished incredible feats. At this point who is his closest confidante? Who is he turning to for support? Clive Standen: “I think that’s the question, isn’t it? Who is he turning to? It’s always the god. When you’ve been a Viking all your life and you’ve worshipped those gods, they’re always the people you turn to. And, there’s so many of them to turn to in the pagan religion. But now he’s embraced another religion and he’s got that god, but who is he turning to in his old age? When you find god, if you find god, when you’ve got two entirely different religions, who do you turn to? Have they shunned him? He’s now trying to prove to the gods that he’s going to put right what once went wrong. He’s going back and he’s trying to hedge his bets, as did the real Rollo in history. The real Rollo, Dudo of Saint-Quentin wrote – one of the historians – said that in his later years in life he lined up a hundred Christians soldiers in front of him in the town square and had them all beheaded. And at the same, he sent a hundred pounds in weight of gold to the Christian churches. So, in one way he’s trying to appease Odin by giving him 100 sacrifices. At the same time, he’s sending all that money to the church to kind of appease the Christian god. This is a man who’s completely at his wit’s end. ‘I just don’t know. I want to go somewhere!’ He just doesn’t want to go to hell. We didn’t want to play it that way. The historian I’m talking about wrote it that way, but he was very one-sided in history and I think that kind of history down the Christian side is very bastardized and very one-sided. Dudo of Saint-Quentin was writing about Rollo because he was commissioned by the current Duke of Normandy, so he’s obviously going to write his ancestors in a very warm light. But, we wanted to have that in there. This is a man who’s lost and he’s trying to find which gods are going to accept him in the afterlife, and I think that was a nice little homage to that part of history with Rollo that we found. Is playing the older version of Rollo more fascinating for you as an actor than playing Rollo in his younger years? Clive Standen: “Oh, yeah, definitely. But, it’s a journey. Once I’ve done something, I never want to do it again anyway so that’s what’s so great about a character that almost reinvents himself. Because once I’ve done that season and I’ve played that part of his life, I’m done with that. Just like in life in general, Clive Standen has no regrets because I would never do anything the same way again. I’d do it all different to see what it was like the other way.